The parking and transportation plan will be posted closer to the event date. Is there a fee for admission or parking? No! 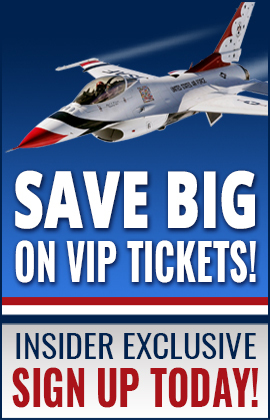 As an air show on a military installation, this show is free and open to the public! Yes. The parking locations will have designated handicapped-accessible parking and handicapped-accessible transportation will be provided to and from the air show grounds. When will the flying begin? The 2020 show schedule will be published closer to the event date. Be sure to check the weather before the event and dress accordingly. We encourage guests to bring sunscreen and sunglasses, a hat, and of course, comfortable shoes. Our ramp is large and in order to see everything, you’ll have to cover some distance. Small purses or fanny packs are permitted, subject to approval by gate security personnel and a hand-search at the security checkpoint. Storage bags such as backpacks, briefcases, duffle bags, suitcases, and large camera bags ARE NOT permitted. Small purses are permitted, subject to approval by gate security personnel and a hand-search at the security checkpoint. Large purses (tote bag type), storage bags such as backpacks, briefcases, duffle bags, suitcases, and large camera bags ARE NOT permitted. Yes. There are no security restrictions on these items. However, large camera bags ARE NOT permitted. Bring only necessary camera equipment, leaving extra attachments at home. A small fanny pack or camera vest is useful for carrying extra memory card, batteries and small lenses. Can I bring a cooler, water, drinks and/or food? Water is allowed in a single clear plastic bottle. Coolers, cans, or glass bottles ARE NOT permitted. Please do not attempt to bring food or drink other than items for infant needs. These items will not be permitted on the airfield. All items brought are subject to approval by gate security personnel and a hand-search at security checkpoint. Small “rain umbrellas” are fine to bring (small ones that fit in a purse or bag), but the big golf umbrellas or shade umbrellas are not permitted. Yes. Strollers will be hand-searched at the security checkpoint. Please bring only necessary items in a small diaper bag, subject to hand-search at the security checkpoint. Large diaper bags will not be permitted. Small coolers are permitted for medication and infant needs but WILL BE searched. Yes. Small folding chairs, like the type that come in carrying bags, are permitted. If you bring a chair that comes in a bag, please remove it from the bag prior to going through the security checkpoint so that the chair and bag can be searched. No pets are allowed for the public. Service animals are authorized with proper documentation. Are scanners allowed at the Air Show? Yes. Concessions and souvenirs will both be available form vendors at the show. Can I bring bikes, heelies, roller blades or skateboards? No. These items will not be allowed through the security checkpoints. Examples of prohibited items include but are not limited to: firearms, knives (including pocket knives and all-purpose tools, i.e. Leatherman), alcohol or illegal drugs/paraphernalia, large golf umbrellas, scanners, backpacks, coolers (other than small coolers for medication and infant needs), and large bags. The following items are allowed but will be searched (small purses, small diaper bags if accompanying a child, small camera bags, and lawn chairs). If I cannot bring something in, can I go out to my car during the show? The air show grounds are separate from the parking areas. In order to retrieve something from your car during the show, you’ll need to board a bus back to the car lot. Should you then want to return to the show grounds, you’ll need to go through the security checkpoint again and board another bus back to the airshow. Keeping this in mind, please plan accordingly, bringing what you need for the day within security guidelines. No. The parking location is separate from the show grounds, and tailgating will not be permitted. Smoking will be permitted in designated areas and strictly prohibited outside of these areas. No ID is required to gain access to the installation; however, all Ohio state laws requiring identification apply for driving and purchasing alcoholic beverages. Yes. Portable restrooms will be located throughout the air show grounds. Several will be located near parking areas and along high-traffic routes. Yes. Many of the performers make themselves available for autographs and pictures during the show. Hashtag your photos #yngairshow when you post them to social media. We’d love to see them! This event will have jets that take off, land, and perform. Hearing protection should be the same as you would use at any event that will be extremely loud. Visitors to the Air Show are encouraged to bring some form of hearing protection with them. How will traffic be handled to and from the Air Show? Safety is always a primary concern at air shows. The personnel at the Youngstown Air Reserve Station work very closely with local and federal authorities to ensure safety. They follow and enforce all security rules and regulations required. You will notice extra security at the air show, both military and civilian. What will security be like the day of the show? Be prepared for 100% security checks with metal detectors at all parking locations and entrances. All hand-carried items WILL be searched. All confiscated items WILL NOT be returned. Containers such as backpacks and coolers ARE NOT allowed to be brought into the show, you can leave them in your vehicle. Some exceptions will be made for items such as small diaper bags, small purses, and folding lawn chairs. Visitors must submit them to security personnel for an inspection. Weapons are strictly prohibited. Weapons include, but are not limited to, firearms, blades (including pocket knives), blunt objects, edge weapons and pepper spray. Patrons with firearms will be asked to leave the installation or their weapons will be confiscated and will not be returned. Amnesty boxes will be available. We are in the early phase of planning a great air show! We will post contact information for questions not listed on this page when we are closer to the event date.